Should Pluto Be a Planet? In addition to being the central source of light and heat in our solar system, the Sun has also been a source of historical, religious, and scientific inspiration. Because of the important role the Sun plays in our lives, it has been studied more than any other object in the universe, outside our own planet Earth. Today, solar physicists delve into its structure and activities to understand more about how it and other stars work. From our vantage point here on Earth, the Sun looks like a yellow-white globe of light in the sky. It lies some 150 million kilometers away from Earth, in a part of the Milky Way galaxy called the Orion Arm. Observing the Sun requires special precautions because it is so bright. It's never safe to look at it through a telescope unless your telescope has a special solar filter. One fascinating way to observe the Sun is during a total solar eclipse. This special event is when the Moon and Sun line up as seen from our point of view on Earth. The Moon blocks the Sun out for a short time and it's safe to look at it. What most people see is the pearly white solar corona stretching out into space. Gravity is the force that keeps the planets orbiting inside the solar system. The Sun's surface gravity is 274.0 m/s 2. By comparison, Earth's gravitational pull is 9.8 m/s2. People riding on a rocket near the surface of the Sun and trying to escape its gravitational pull would have to accelerate at a speed of 2,223,720 km/h to get away. That's some strong gravity! The Sun also emits a constant stream of particles called the "solar wind" that bathes all of the planets in radiation. This wind is an invisible connection between the Sun and all the objects in the solar system, driving seasonal changes. On Earth, this solar wind also affects currents in the ocean, our day to day weather, and our long-term climate. The Sun is massive. By volume, it contains most of the mass in the solar system—more than 99.8% of all the mass of the planets, moons, rings, asteroids, and comets, combined. It's also quite large, measuring 4,379,000 km around its equator. More than 1,300,000 Earths would fit inside it. The Sun is a sphere of super-heated gas. Its material is divided into several layers, almost like a flaming onion. Here's what happens in the Sun from the inside out. First, energy is produced in the very center, called the core. There, hydrogen fuses to form helium. The fusion process creates light and heat. The core is heated to more than 15 million degrees from the fusion and also by the incredibly high pressure from the layers above it. The Sun's own gravity balances out the pressure from heat in its core, keeping it in a spherical shape. Above the core lie the radiative and convective zones. There, the temperatures are cooler, around to 7,000 K to 8,000 K. It takes a few hundred thousand years for photons of light to escape from the dense core and travel through these regions. Eventually, they reach the surface, called the photosphere. This photosphere is the visible 500-km-thick layer from which most of the Sun's radiation and light finally escape. It's also the origin point for sunspots. Above the photosphere lies the chromosphere ("sphere of color") that can be seen briefly during total solar eclipses as a reddish rim. The temperature steadily increases with altitude up to 50,000 K, while density drops to 100,000 times less than in the photosphere. Above the chromosphere lies the corona. It's the Sun's outer atmosphere. This is the region where the solar wind exits the Sun and traverses the solar system. The corona is extremely hot, upwards of millions of degrees Kelvin. 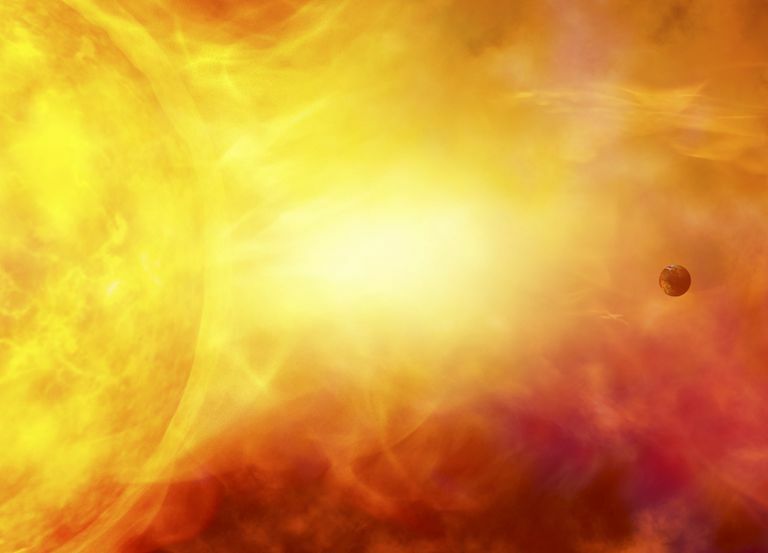 Until recently, solar physicists didn't quite understand how the corona could be so hot. It turns out that millions of tiny flares, called nanoflares, may play a role in heating up the corona. In comparison to other stars, astronomers consider our star to be a yellow dwarf and they refer to it as spectral type G2 V. Its size is smaller than many stars in the galaxy. Its age of 4.6 billion years makes it a middle-aged star. While some stars are nearly as old as the universe, about 13.7 billion years, the Sun is a second-generation star, meaning it formed well after the first generation of stars were born. Some of its material came from stars that are now long gone. The Sun formed in a cloud of gas and dust starting about 4.5 billion years ago. It began shining as soon as its core started fusing hydrogen to create helium. It will continue this fusion process for another five billion years or so. Then, when it runs out of hydrogen, it will start fusing helium. At that point, the Sun will go through a radical change. ​Its outer atmosphere will expand, which will likely result in the complete destruction of planet Earth. Eventually, the dying Sun will shrink back to become a white dwarf, and what's left of its outer atmosphere may be blown to space in a somewhat ring-shaped cloud called a planetary nebula. Solar scientists study the Sun with many different observatories, both on the ground and in space. They monitor changes in its surface, the motions of sunspots, the ever-changing magnetic fields, flares and coronal mass ejections, and measure the strength of the solar wind. The best known-ground based solar telescopes are the Swedish 1-meter observatory on La Palma (Canary Islands), the Mt Wilson observatory in California, a pair of solar observatories on Tenerife in the Canary Islands, and others around the world. Orbiting telescopes give them a view from outside our atmosphere. They provide constant views of the Sun and its constantly changing surface. Some of the best-known space-based solar missions include SOHO, the ​Solar Dynamics Observatory (SDO), and the twin STEREO spacecraft. One spacecraft actually orbited the Sun for several years; it was called the Ulysses mission. It went into a polar orbit around the Sun. What are the Sun's Stellar Neighbors? Do You Know What Day the Earth is Closest to the Sun? What Makes a Terrestrial Planet?